Greek Salad - a blog from Greece! : Shakira and Piqué at Mykonos, the Greek island! Read this in Swedish: Shakira och Piqué på Myconos! 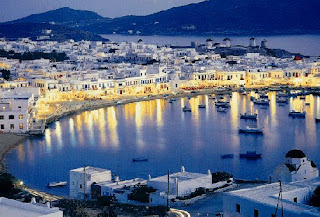 See the video with the couple at Myconos. Shakira says thankyou in Greek(ευχαριστώ - "efcharistó")! The worldfamous singer and composer, Shakira, came to the Greek island Rhodes for one day 2 weeks ago. That time she came alone, to perform at a private event arranged by a German insurance company. Last wednesday Shakira arrived to the beautiful Greek island Mykonos together with her fotball-player, the ten year younger Gerard Piqué (Barcelona) with great secrecy. They are staying for one week at a very nice hotel. You hardly recognize her as brunette! "Waka Waka", the official VM-track for VM in football 2010 is the third most seen videoclip in the history with more than 350 million viewings! And except for planning a new trip to Greece(I hope...)the couple are playing scrabble: Shakira-Piqué playing Scrabble. Bradgelina, De Niro and Travolta on vacation in Greece!